Do your posts always get fewer likes and comments? No matter how hard you try, none of your followers seem to be interested in your posts. You have invested time and effort in creating a large follower base, but still very few among them interact with your content. What could have possibly gone wrong? The answer could be simple yet alarming- most of your followers are ghost followers! But don’t panic – we are going to educate you about ghost followers and tell you how to get rid ghost followers on Instagram for once and ever. Many people ask- what is a ghost follower on Instagram? Ghost followers are inactive accounts that find their way in your follower list. They just sit idle without ever commenting or liking your posts. Most of the ghost follower accounts are made to spread spam or promote services completely unrelated to your niche or interests. How do You Get Ghost Followers on Instagram? If you have ever paid to gain followers on Instagram, then it could be the culprit behind your ghost followers. Services that promise to get you thousands of followers in 1 day or week or anytime for that matter target fake and bot accounts. Instead of getting real and active followers, you end up with ghost followers. Using excessive hashtags in your posts qualify as spam and attract unwanted ghost followers. The fake accounts and bots target the hashtags and end up following your account. It’s better to use your hashtags wisely and keep them restricted to a reasonable number. 9 to 11 hashtags seem to be the ideal count to generate maximum engagement. The fake accounts follow as many accounts as possible so that people follow them back. You can be the target of such a growth strategy with no fault of yours. But you may not need to delete ghost followers Instagram that come this way, as they unfollow your account if you don’t follow them back. Should I Care about Ghost Followers? Fake accounts don’t like or comment on your posts like real followers. Let’s say you have 10,000 followers out of whom only 200 engage with your post. That means you have an engagement rate of only 2%. Instead, if you have 1,000 real followers out of whom 100 post comments, you have an engagement rate of 10%. Surely, you will want to go for higher engagement rates that come with real followers. See how many likes this post got in just 5 hours! Buying followers is against Instagram terms and conditions. Accounts which use fake accounts to grow their followers can face suspension for violating the terms. Instagram is also known to remove fake accounts which could drastically impact your follower count. Not everyone wants to gain followers to become famous. Brands and influencers use their Instagram audience to market their products and services. Ghost followers are fake and bot accounts who will never show interest or buy your stuff. Now let’s find out how you can get rid of all those unwanted ghost followers. Often the Instaghost accounts will have generic profile pictures. You may find selfies copied from other Instagram accounts which fool many people into believing they are real. If you find only a single selfie in the whole account, it may very well be fake! Sometimes fake accounts don’t use any profile picture and leave it blank. Ghostie Instagram accounts follow other accounts in mass in order to gain follow-backs. You shouldn’t be surprised even if you find thousands of followers in a fake account. But look out for the number of following- if it’s too high, then the account may be fake. You may find illegible characters and random numbers in place of a well thought-out username that people use in Instagram. The usernames don’t have any relation to the nature of the account and are just created randomly. People invest in writing an appealing bio for their Instagram accounts to attract followers. They out in the effort to describe themselves, write about their interests and passion or provide company and product information. But if you find a total blank in place of the bio or just a few meaningless words, you may be staring at the example of what is a ghost follower! So check the bio to determine whether the account is real or fake. 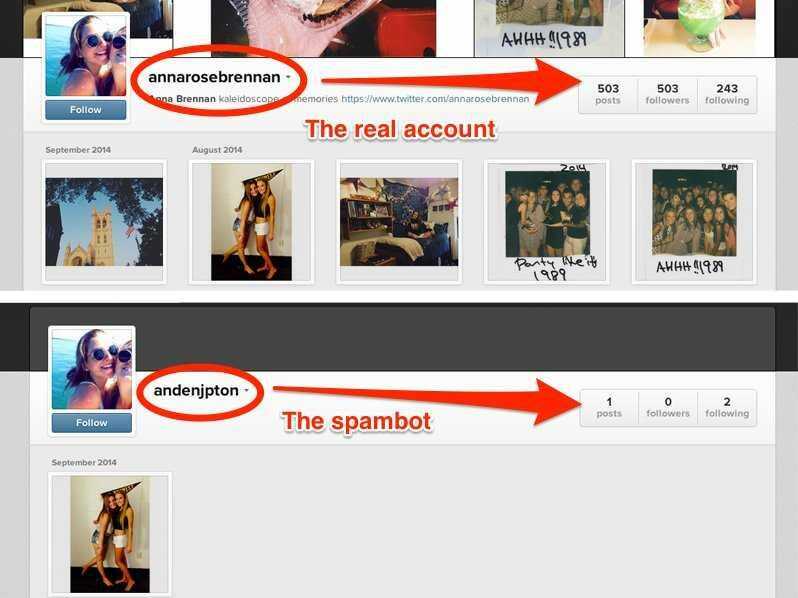 The number of posts shared by an Instagram account is a sure sign to spot a fake account. If you see the account has shared only 1-2 posts in weeks and months, you can surely tell it’s a fake one. You won’t find the fake account posting comments on other’s posts or even hitting likes on your picture! They just stay in your follower list without any engagement or adding value. Now you know how to spot a fake account. Now let’s see how to get rid of ghost followers. Go to the profile of the ghost follower and find the ‘unfollow’ button. Now, all that you need to do is make a gentle tap on it to get rid of ghost followers on Instagram. Deleting ghost followers may not be sufficient and they can come back once again. You should block each one of the fake and bot accounts so that they can never reappear on your list. If you are wondering how to get rid of spam followers on Instagram, use the same technique to spot spam accounts and remove them. So, what are ghost followers? They are fake, bot and spam accounts that only sit in your list without contributing towards your engagement. How to find ghost followers on Instagram? Evaluate their profile pictures, look for the number of posts, check out the count of followers to following and take a look at the bio- you will be able to make out the ghost followers. How to delete ghost followers on Instagram? Hit the ‘unfollow’ button and block the accounts to remove ghost followers Instagram forever!